“Very Unusual” Mid-June Cold Surprises Germany…Surface Temperatures Around Hamburg Fall To -3°C! Browse: Home / 2015 / June / 17 / “Very Unusual” Mid-June Cold Surprises Germany…Surface Temperatures Around Hamburg Fall To -3°C! The year started out on the mild side in Central Europe, but since early May temperatures have been stubbornly on the low side. Ground surface frost is already rare enough over the northern German lowlands in May, let alone June! In Germany farmers and weather hobbyists often talk of these annual June cold spells, calling them Schafskälte – or “sheep cold”. They often occur in mid June when cold polar air grips the country. But this year the phenomenon appears to be especially pronounced. 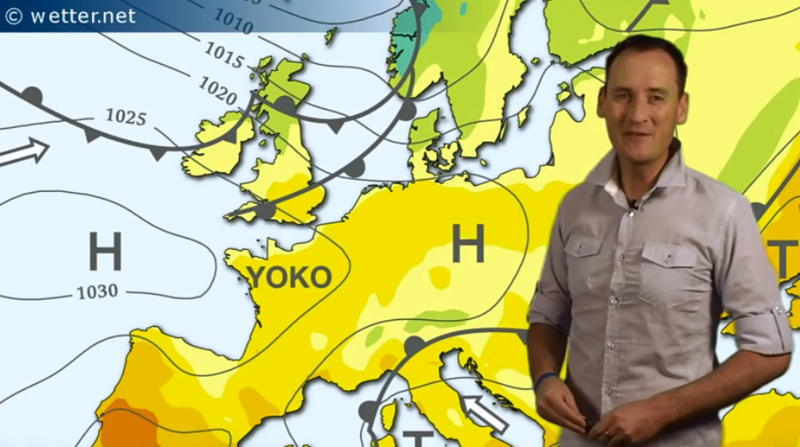 In the video the commercial meteorologist also says that after today’s milder temperatures the “grizzly summer weather” shows no signs of letting up. Daytime temperatures are forecast to stubbornly remain stuck in the 50s and 60s (14 – 20°C) over the rest of the week. “In Lübeck and Hannover, just above the ground readings of down to -2°C were taken. Even in Berlin early this morning the thermometer showed ground level frost with readings around 0°C. Moreover, large parts of northern Germany are being gripped by a deepening drought. Here as well no significant amounts of rainfall are in sight. The latest buzz is that Germans should not be expecting any type of “barbecue summer” this year. Global Warming, er, Climate Disruption. It’s much worse than we ever expected. Let’s get some cherry-picking, logically stymied paper published; after that, our models will always have predicted this to a T.
so far, 2015 was an extremely hot year globally. That is the real unusual! Depends on which dataset you’re looking at and choosing to believe. If you’re obsessed with warming and are cheering for a global warming disaster, then you’ll unquestionably accept NOAA. Meanwhile satellite data show cooling for the past 10 years. UAH does show warming, at about 0.1°C per decade (and this is not ground level warming!). The claim was over the last 10 years (120 months). So what is the trend in new UAH data for that timeframe? RSS is very flat but still UP, not down! You mean you aren’t capable of calculating it???? Since 2005, UAH oceans has a trend of a MASSIVE 0.001C per year. Are you scared of the warming yet?? Whoops, wrong column. Oceans since 2005 is 0.002C /year. so we agree, that the last 10 years show warming and NOT cooling in all datasets? That is what i said above! Flat as a proverbial pancake.. and you make that out as warming ? Seriously? You have a tilted mind. Warming has ceased, and did so 15+ years ago. Even the rabid Max Planck institute admits it. Get with the consensus, dude !! I hear that you have a supreme mathematical education. Yet you seem to have never heard of the Nyquist(or Shannon) theorem. OF COURSE we prefer the satellite data. Why would ANYONE use ground stations when you can have complete area coverage. Surface stations were state of the art 50 years ago. Hansen’s homogenization is a clear sign that the warmunists very consciously picked a data source they could tamper with to their liking. Otherwise why would a SPACE AGENCY use NO satellite data in their Global Warming offices at GISS – named after a ROCKET SCIENTIST. I mean, come on, could they be any more obvious about their fraudulent intentions? An El Nino now would cause a short spike (which the alarmista would hype like crazy) followed by a deep trough (which they would totally ignore). The only effect on the decadal temperature trend would be a steepening of the slight cooling trend. Don’t you realise that an El Nino is a release of energy from the ocean.. ie an ocean cooling event ?? The 1998 El Nino was the final release at the end of several strong solar peaks in the latter part of last century. sod, it is not unusual at all that warmunist scoundrels pose as scientists and forge measurements. That is what they DO! Are these kind of insults the norm here? the first five months of 2015 look pretty extreme to me. And i did challenge the claim that the trend is down over the last 10 years with real data. Where are your arguments, where is your data? You should offer more than insults! Lower than the Minoan and Roman warm periods, so pray tell me, how is that extreme? Wow, so you have data of annual global changes from Roman times?!? Can i borrow your time machine next week for a short trip? Again: is the trend over the last 10 years up or down? Where is your data? The trend over that last 10-15 years is ZERO. There is an enormous amount of data showing that the MWP, RWP and the rest of the Holocene was warmer than now by at least a couple of degrees. Temperatures during the current tiny molehill out of the coldest period of the last 10,000, are not extreme, they are actually quite cool for this interglacial. There is ZERO temperature trend this last decade. “the first five months of 2015 look pretty extreme to me. Hey genius, why is there a “NASA” in the image title when NO SPACE ACTIVITIES contributed ANYTHING to the “data”? Why does NASA not use ITS OWN SATELLITES for its climate propaganda? Maybe they have two products – one for the propaganda and one for the real strategic planning? Why would they not use satellites when Global Warming is the WORST problem of humanity EVER? I’m sure you have the explanation so please give it to us. German Greens protest against wind turbines because they destroy the countryside and make the land uninhabitable for the natives – who do not even earn money through it. The German Greens talk, of course,only about Mexico. No such rights exist in their opinion for German natives. You need the idiots at the UKMO and their useless model to predict bar-B-Q summers. Isnt CO2 supposed to trap more heat especially when no clouds are present like in high “Yoko”? Ono … (sorry, couldn’t resist). I think it’s only water vapor that’s responsible for trapping heat. Why is “YOKO” on the map? It’s the name given to the high pressure system over Britain. Are they really naming individual high pressure systems now? That could get rather tedious !! …. and now high pressure systems get names. I wonder how the “feeeeeel” about that? They’ve been named in Germany like since forever. They used to use female names for Lows, and male names for high. They had to stop this as a consequence of feminism. The reasoning was that Lows bring rain, i.e. fertility. Feminists hated the idea. The Germans are freezing to death from Globull warming, its time to build a wind turbine.